When I was starting out with Web and graphic design, I was always wondering about the fonts that real designers use. So I conducted a research to find out the most popular fonts designers like to use, their best practices, and also out of personal curiosity, their typographical needs. It would be nice to know which font is good for which situation and today I am sharing with you the results of my research. Through a combination of data collected from Polldaddy, Forrst, Facebook and Twitter, I got feedback from 34 designers from 14 countries answering questions about their favorite fonts and explaining to me why they love them. By analysing all the input submitted I have uncovered some interesting information, which has been put together in an infographic by friends in Piktochart. Below that, check out the Top 10 list of free and premium fonts, and some of the interesting reasons why designers have their favorite fonts. Click on image to see in full scale. 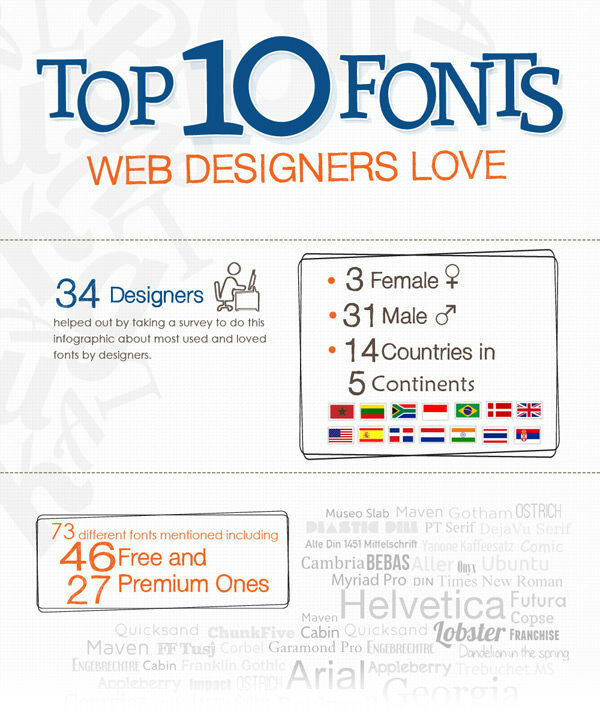 Here is the list of Top 10 free fonts mentioned by Web and graphic designers in the survey. Fonts that come bundled with operating systems, fonts like Arial, Verdana, Times New Roman, Georgia, and Tahoma have been excluded. This is the list of most popular premium (paid) fonts among designers. Some of them are very expensive but the quality of the font speaks for itself. Impact – lovely striking bold headline font, easy to read. Avant garde – bit common but popular with clients, smooth, no fuss lettering. Great for headings, sub-headings and body text (if there’s not too much). Jr! hand – this turns up in a lot of my t-shirt designs. Courier – great for sale-type banners, readable and available everywhere (handy for the Web). Frutiger – It’s temporal, balanced and natural. Futura – elegance, simplicity, looks good almost everywhere. Didot – elegance and personality. Lobster/Marketscript – my favorite retro manuscript font. Museo Slab – a recent discovery. League Gothic – a better impact. Courier – another elegant font. Rockwell – good for headlines. Gills Sans and Helvetica are always good options too. Century Gothic – solid circular letters. Trebuchet MS – high readability, web safe, nice. DejaVu Serif – my favorite serif font. Rockwell – my favorite slab font. Convington – very nice modernized retro font. Comic Sans – makes me laugh. Lobster has been so overused it’s become the new comic sans! The most popular font used by designers is definitely Helvetica Neue. If it is free-for-web fonts, FontSquirrel is for the win but as such, my ‘favourite’ fonts are from a very limited stock. Trebuchet Ms. mostly because it’s on the standard web compatible list, underused, has some great lines and a very tasty italic version. Quicksand – love the light version – although the font in general is well produced and has some great lines. Makes – for good heading text, albeit softer, with its subtle curves. Museo Slab – a great slab-serif. All the Museo’s are great in their own right really, particularly the Slab. Marketing Script – what a great little font – has a great hand-written feel without being ‘kiddie’. Really like using it as a constrained "easy" font. Aller – another great font. The different weightings are handy, but the display variant lets loose a little and makes for some great headlines. ChunkFive – a great, solid heavy font. Really like the heaviness and impact it makes in the page. DIN, Gotham, Caecilia, FF Meta, Helvetica Neue. With the exception of Caecilia, all of these are sans-serif fonts with loads of varying weights. Caecilia is also on this list because it is very geometric and I love the Slab. Also, all of these fonts have a relatively large x-height, which is my preference. Franklin Gothic – this font screams for attention. It’s big, bold, and it plays well with other sans-serif fonts. Helvetica – when it comes to readability, it’s Helvetica or Tahoma. It has its own personality (Inserat or Neue). When it comes to designing a logo, when it comes to the typography, I always play with Helvetica first. Tahoma – this font is a team player. When it comes to integrating content into the layout and putting everything together, Tahoma looks like it was made to be there. Brush Script Std – the handwriting look blows me away, in general. In online projects, they tell a story and it appeals to the ego too. Georgia – this font works great when it comes to capitalizing everything. When you play with the kerning, the letters always look good. It fills the space between the letters, not add to it (too much space lettering in Helvetica may destroy the visual impact). So there you have it a brief but telling research about the relationship between designers and their fonts. A big thank you to all the designers who helped me out by taking the survey, answering questions as well as sharing their favorite fonts with the design community at large. What about your favourite fonts? Have your say.